Dear Californians: Stop Whining, Start Voting! Photo credit: Howard Jarvis Taxpayers Association. Look, California, stop it. I cannot control who is on the ballot in June or in November. I cannot help it if you are not excited if a Republican does not make it to the General election in November. Personally, I am excited about voting to repeal the gas tax. I would hope that everyone is. Passing this repeal is do-able. The majority of Californians are unhappy with the gas tax. We complain about the state of things in CA, someone does something about it, it gets on the ballot and then no one shows up. It needs to be different this Nov. I think it will be because so many of us helped with the effort. We helped on social media, gathering signatures, giving money, etc. It’s the most important thing on the ballot in my opinion, and that goes for June and Nov (since the June ballot has a measure requiring the funds to be used on roads). Then, the big one, the repeal on the Nov ballot. I don’t know if any Republicans will be on your Nov ballot but I do know that the gas tax repeal initiative will be. Further, it’s politicians, including a Republican, who imposed this tax on us. I’m always more excited about repealing anything that is costing me money, or voting for something that will save me money, than voting for any politician. 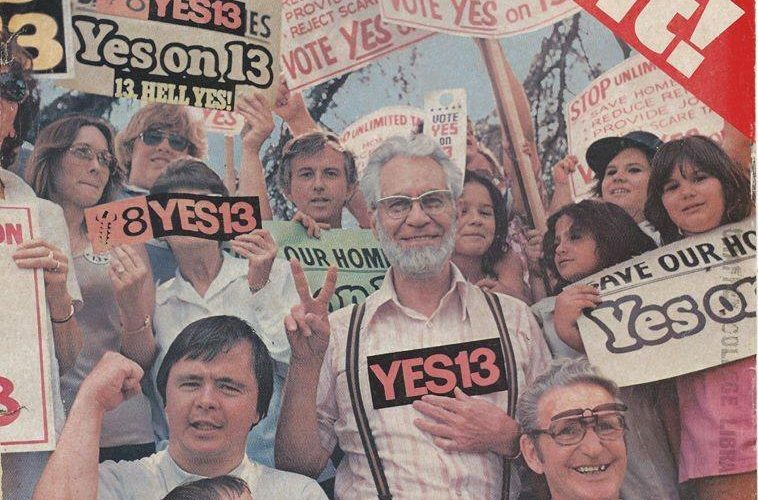 In 1978, when Prop 13 was voted in, it took a lot of motivated voters to get to the polls to vote for it. My parents were among them. And though I was too young to vote, I appreciate those votes and am still reaping the rewards of that particular election. In fact, the 40th anniversary of the passing of Prop 13 is June 6th, 2018, the day after primary day, and it’s still as popular now as it was when it passed. How better to celebrate the 40th anniversary of this great taxpayer revolt than by showing up at the polls yourselves? I am tired of seeing all the posts about how Texas beats CA. One thing Texas lags behind CA in is in property taxes. They are FAR higher in TX than in CA, both in percentage and in our case, when we priced homes in TX, in dollars. So, God Bless Prop 13 and those who voted for it all those years ago. Similarly, this gas tax repeal will save future generations of Californians significant money. If you don’t get out and vote, it won’t pass. So please, stop whining about something that may not ever be again in our lifetimes, a Republican Governor of California. Start talking to the Millennials about that. Do plan on voting in both June and November for the gas tax repeal. I will appreciate it, future drivers will appreciate it, your kids will appreciate it, and the many people who worked hard to get this on the ballot will appreciate it! . ULTA and Honey Will Save You Money. 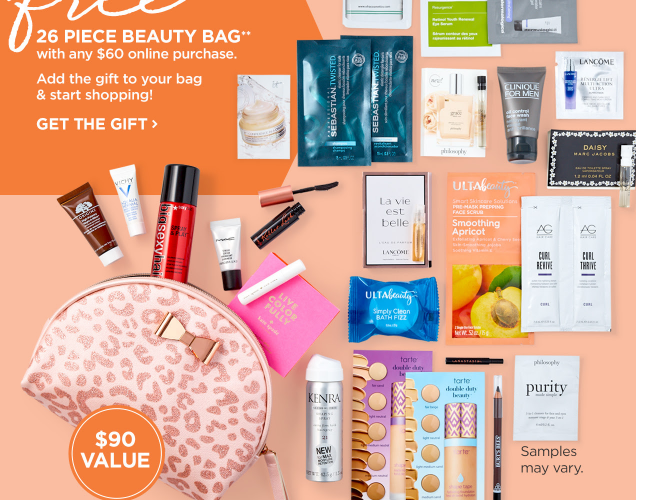 If you don’t shop on Ulta and use Honey (chrome extension), you should. This is the order I just placed. 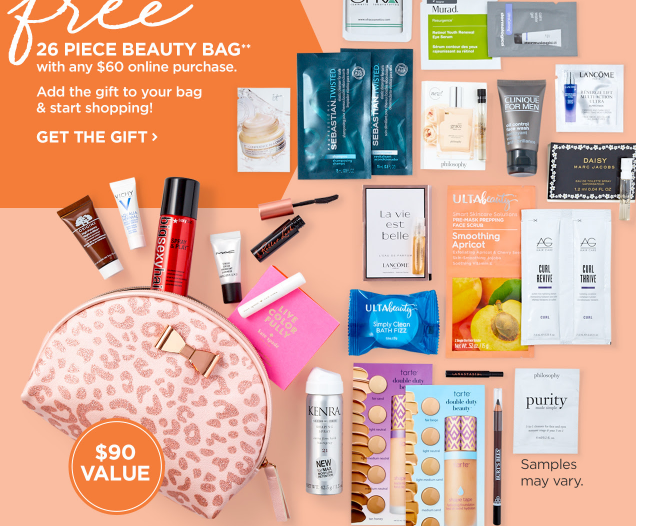 Ulta sends me emails with freebies. I earn points (pretty quickly) and the rest is just savings. There is one product I use all the time. I wait for these free offers, use my points, the Honey extension adds the coupon automatically. Voila. It’s my favorite online retailer besides Amazon. My hair stylist is at ULTA and that’s how I earn points so quickly. Your results may vary. Ulta & Honey will save you money. Yes, Send Your Thoughts and Prayers. I hate to politicize a tragedy and I really never do but I always think of the victims and families and I always send prayers. Recently and today especially, I see this being mocked. I know that thoughts and prayers won’t resolve the problem we obviously have and what will, I do not know. Nor will this complex issue be decided today. 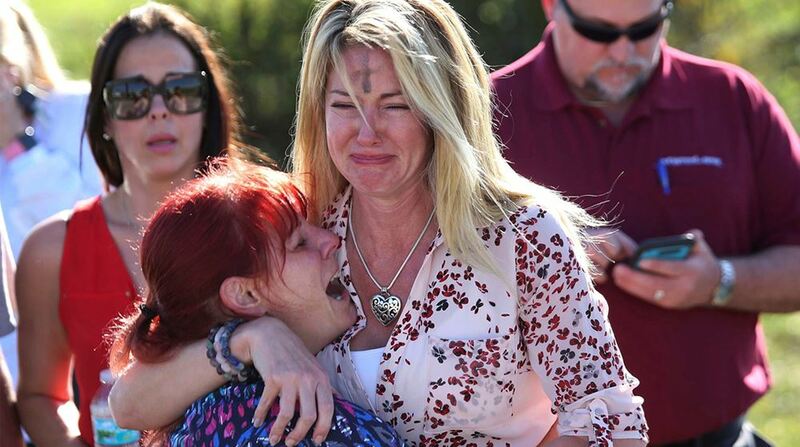 Here’s what I do know, the students and parents affected by the Florida school shooting were asking for our prayers and are thanking us for them. This morning, I turned on CNN and the reporter was interviewing one of the students, a football player. The reporter asked “what do you want to happen?” The student said “I hope everyone prays for” the victims. Let’s stop the war on thoughts and prayers for starters. It’s all I can do for those who are traumatized and the victims of this horrible tragedy, especially today. 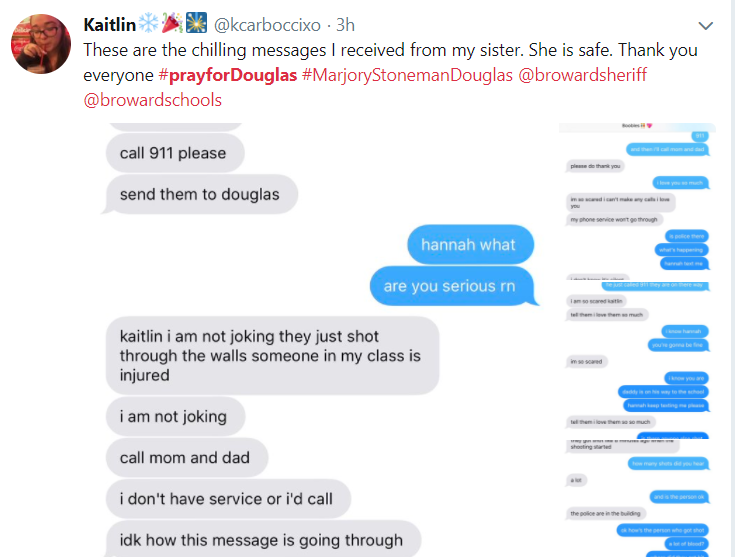 If we cannot at least agree that “thoughts and prayers” are not harmful, there is no hope that we as a country will ever resolve the mass shooting problem. One Year Old Vizsla Mix Brothers Need Rescuing. They Are In A High Kill Shelter in South Carolina. UPDATE: Yenny and Yeller have been adopted and will stay together! Thanks to everyone who sent this around on social media! I just saw these in one of my Vizsla Facebook groups. I wish I’d seen it sooner. It was posted at 7:30 p.m., California time. I trust this information to be accurate and there is no indication they’ve been adopted or rescued. Please help if you can! Retweet, share, etc! I have no additional information but you can tweet me at @hipEchik if you think I can help at all. Thank you! Note, the Darlington Facebook page lists them twice as “Yeller” but verifies their time is up today. 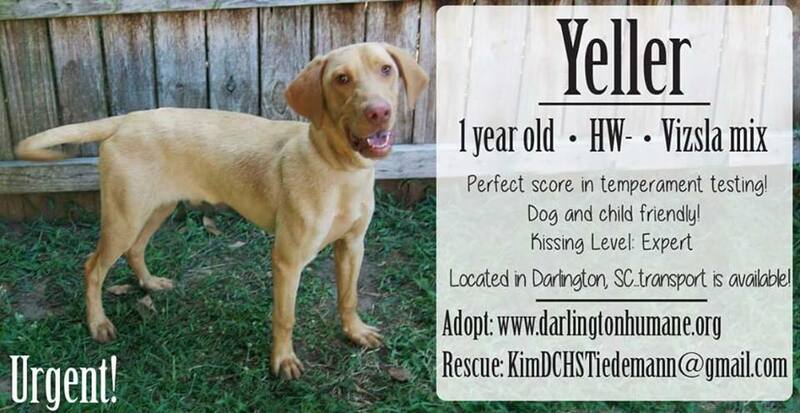 This great boy is listed as a Viszla mix in a high kill shelter in South Carolina. His 30 day stay is up today, 8/5/15, and he’s at risk to be put to sleep. He has a brother I will post as well. They are available for adoption or rescue asap. Please see the information on the flyer and help if you can. This great boy is listed as a Viszla mix in a high kill shelter in South Carolina. His 30 day stay is up today, 8/5/15, and he’s at risk to be put to sleep. He’s available for adoption or rescue asap, as is his brother who I also shared on this site. Please see the contact information on the flyer and help if you can. They are both great boys! I cannot take it anymore. This is the first in a series on social media etiquette. I work and interact in social media. I’ve seen a lot. Much of it is good, some is bad, and occasionally, it’s horrid. I find myself saying, Whiskey Tango Facebook far too often. I’ve made errors myself and, I’ve learned from them. If you choose to read this, know that it comes from first hand experience. Hopefully this advice will cause you to think before you post. The event that precipitated this post is something that I’ve seen time and again. In fact, it’s happened to me. Yesterday, another friend found out about his parent’s hospitalization via a public Facebook post. It upset him, it upset me and it’s time someone writes about it. I tend to eschew the posting of social media “rules” but, some basic SoMe etiquette guidance is obviously in order. One should never find out about the serious illness or death of a close friend of family member via social media…EVER! In my experience, the offenders of this rule are not the much maligned millennials. I have some words of wisdom for them also but this particular post is directed at those older and ahem, wiser folks. So, let’s get to the meat of the matter. Requirements though are often dismissed when there is a family dynamic such that certain people do not “speak” to one another. If that’s your situation, you must find a solution that takes this into account. If you know that a phone call is impossible, you must have another plan. First, I suggest that you find an impartial person (an aunt or uncle, niece or nephew) that is designated as the communications person for the family. I encourage having a back up person as well. This sounds simple but it can be a bit complex as the designated “comms” person will have to have HIPAA authority, (legal authority to obtain private medical information), as to the status of the health of the family member. Without getting too far in the weeds, HIPAA is the law that protects patient confidentiality. Everyone should have a person or two that is designated (in writing), to be the recipient of a patient’s medical information. In other words, have a point person for medical personnel to be able to legally disclose medical information to. Most hospitals and Dr. Offices will have HIPAA waiver forms. The forms must be filled out before there is an emergent situation. A copy must be on file with the patient’s hospital and Dr but I also suggest that the family communications person also carry a hard copy of the HIPAA release with them. All of this requires some pre emergency planning. “Dear All: This is to let you know that Dad (Jim) is at Cedar General Hospital in Cedar Rapids, Iowa. His Dr. Is Susan Jones, M.D. The phone number to the nurse’s station is 555-555-5555. He is currently in the surgical ward being evaluated for possible gallstones. He is stable and they are managing his pain. He had an ultrasound and they are discussing the benefits and risks of a possible surgery. If they decide to go forward with the surgery, they will do it via laparoscopy so the incisions and the recovery time will be easier. He’s also on intravenous antibiotics (and they do know of his allergy to Penicillin). He’s currently on a liquid only diet. The surgeon will evaluate him at 11:00 a.m. Eastern time tomorrow, Tuesday, June 5th. We will know more then and I will update in this group immediately after we know something more. Dr. Jones asks that family not call his room at this time as he is sedated from the pain medication and sleep is the best thing for him. I am the point person and Joe is the back up. One of us will keep you informed if anything changes prior to the above appointment. If you have any questions, please post below and I will ask the Dr. tomorrow. That’s what we know at the moment. He’s doing fine, is not in horrible pain and they will decide on a treatment plan tomorrow. I will be in touch shortly thereafter. As specified in our group rules (above in the doc), please LIKE or comment once you have seen this. Please do not post anything in the public timeline on social media until all group members have seen this. After that, remember dad’s wishes for privacy and keep everything on social media in general terms. In other words, if you go this route, be specific, clear and cautious. Take time to think of all of the questions you would have if you were on the receiving end of such a message. DO have some group rules decided upon before hand and posted in the group document. It’s not ideal, but with so many extended families, dysfunctional families and people that do not use common sense on social media, it’s the best I could come up with. Perhaps you can think of something better. If so, go for it but whatever you decide, make sure all family members (yes, even that person) knows, is on board, and that the “rules” are clear. Oddly enough the aforementioned, much maligned millennials seem to have grasped some of the SoMe etiquette better than the Gen Xers, the in-betweeners and the Baby Boomers. Worry not. I have equal generational critique enough to go around. For example, I plan on addressing how the (much maligned) millennials have no freaking clue how to write a snail mail thank you note. That is another post entirely and one I plan on writing soon. Please, do not wait until this becomes an issue for your family. Make a plan, set up some guidelines and make sure all concerned persons are on board. Duke it out before there is an illness, accident or death. When that time comes, it’s stressful enough without letting SoMe drama exacerbate the already stressful time. No one ought to be the recipient of bad news regarding a family member via social media. Share this post far and wide. Get a plan, and use it. Please and thank you. Dear Congressperson, why have you not co-sponsored HR620 re Tahmooressi? Dear We The People: If you have this blog in hand, please tweet, email and/or call all of the members of this committee who have not co-sponsored (signed) HR620. The twitter handles are indicated below and there is also a “Contact Congress” link for those representatives or supporters who are not on twitter By doing so, you resolve as I do, that you stand with Andrew and you will not rest until he is free. If you have any questions, please contact me on twitter at @hipEchik or Olivia Hammar at @HammarOlivia , or comment on this blog post. Major Update: There will be a hearing on Sgt. Tahmooressi’s case on 10/1/14 and make no mistake, our social media army made this happen! Thank you all. The hearing is essentially the next step is passing the resolution. It provides a public forum for testimony. That said, we still need as many members of the House of Representatives to sign so please, keep it up! As you know, HR620 has been introduced but not co-sponsored by all members of your committee. Please see the roll call as of September 7, 2014 below. We the people do not understand why at least all members of the House Committee on Foreign Affairs have not co-sponsored this resolution. Additionally, please note that Fernando Benitez, Sgt. Tahmooressi’s lawyer, has indicated that passage of this simple resolution may hold weight with the Mexican judge and expedite his release. There are no sanctions against Mexico included in this resolution and frankly, we are befuddled as to why we cannot get a simple resolution signed and passed. There is compelling evidence that Sgt. Tahmooressi simply made a wrong turn into Mexico that fateful night and yet all of our efforts to help him have been for naught. To date, Marine Sgt. Tahmooressi has been imprisoned in Mexico for more than 5 months. As the days and then months have gone by, Sgt. Tahmooressi has become increasingly despondent over his imprisonment. He desperately needs medical care for his PTSD incurred while he was honorably serving our Nation as a two tour combat Marine. Indeed, his PTSD is the reason Sgt. Tahmooressi came to San Diego as he was not getting the care from the V.A. in his home State of Florida that he was told he could get at the La Jolla V.A. Health Center. We are once again appealing to you to co-sponsor HR 620, a politically benign resolution, that may well help Andrew gain his freedom. If there is a reason why each of you will not co-sponsor this, please indicate why. Sgt. Tahmooressi’s next court appearance is tomorrow, September 9th, 2014 and we would like to present the judge with as many signatures as we have and as we can gain today. This has become an urgent matter and we plead with you to co-sponsor, put the bill on the suspension calendar and pass this resolution. Update Edward Royce – R- CA – Chairman has signed. Thank you Rep Royce. Update: Jeff Duncan – R – SC has signed! Thank you Rep Duncan. Adam Kinzinger – R – IL @RepKinzinger * Veteran. Air Force Pilot. Still serving in the Guard. What say you Rep Kinzinger ? To each of you that have not co-sponsored, again I ask why not? This is not a complex bill nor one that would cause any of you political harm in the upcoming mid-term elections. Frankly, it causes me to wonder about this 113th Congress when we the people cannot even elicit a response on such a simple matter. 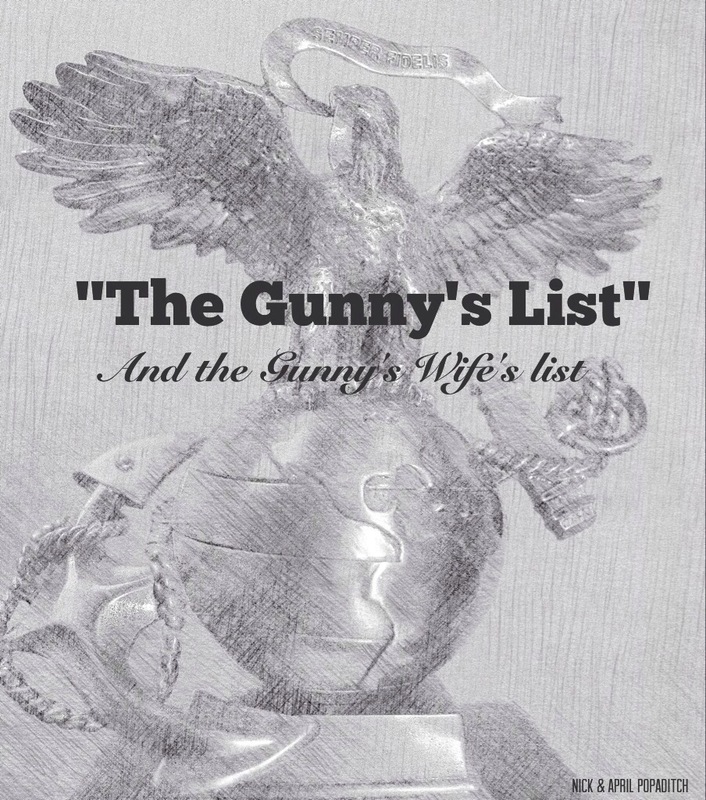 As the wife of a combat Marine veteran, I know more than a bit about the struggles Sgt. Tahmooressi is going through. That said, I cannot possibly know how Sgt. Tahmooressi must feel to have his Country seemingly abandon him when he fought so honorably for her. For the sake of relative brevity, I shall leave this as is. I close with this appeal. On the week of the 13th anniversary of 911, with many of us worried about our Nation’s security, I cannot fathom the thought of Sgt. Tahmooressi spending this anniversary of the very attack that precipitated him going to war languishing in a Mexican prison. I Stand With Andrew and I will not rest until he is free. You can assume that everyone who sends, tweets, and emails this to you resolves the same. Please co-sponsor this resolution and feel free to contact me on twitter at @hipEchik or Olivia Hammar at @HammarOlivia if you have any questions, concerns, or comments. Thank you, Semper Fi and God Bless and Protect these United States of America. Many thanks to Olivia Hammar for doing the research for this post. We have asked you to circulate a petition to President Obama and gather at least 100,000 signatures. You’ve done that. While we are awaiting his (hopeful) response we feel we must help Andrew on many fronts. With that in mind, we are once again asking for your assistance. It is time for all citizens to contact their elected representatives. Some of you are familiar with doing this and others may not be. Fear not, we will walk you through the process. 1) Find your representatives. Every citizen has one U.S. Congressperson and two Senators. We ask that you write, call and possibly tweet all of them. You now have your three representatives. Click on the name of the first representative and it will take you to all of his/her contact information. Included you will see their DC Address, phone number, Fax number, email contact form, their website information (which generally includes their Facebook page) and, their twitter user name. You will also see choices for their local office contact information. It is up to you whether you choose to contact their D.C. office or their local office, or both. Next, return to the homepage (above). Click on your next representative and repeat the above steps. Finally, return to the homepage, click on your third representative and repeat. Now, draft your correspondence or phone your representative. It is unlikely you will reach your representative directly but, you can try. If not, please leave a message for them. 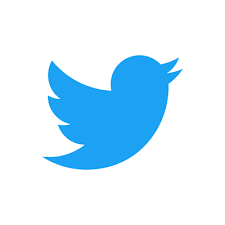 Finally, you may choose to tweet or Facebook them. Most of Congress is on twitter and/or Facebook. 1) A “Snail Mail” letter. These letters are logged and recorded and must be responded to. 2) An Email letter. These letters are also supposed to be logged but it is not as traceable as a “snail mail” letter. Also, tech is not perfect. 3) A phone call. We suggest calling both the D.C. office and the local office of all three of your representatives. 4) A tweet. It HAS happened that a tweet to a representative has been responded to but, there is no requirement or guarantee that they will respond. 5) A Facebook post. The problem with this is that most members of Congress have their FB set so that you can only comment on a post that they have put up. It is the least effective method of communication and one that will likely not be seen or responded to. All of that said, if you can, we suggest doing ALL of the above. What to say? That is entirely up to you. We can only offer suggestions. When writing, the subject line should be “Sgt. Andrew Tahmooressi, imprisoned in Mexico.” We suggest you stay on point. Do not bring other factors (ie illegal immigration to the U.S. and or Sgt. Bowe Bergdahl) into the discussion. Ask for their help. You want them to intercede and help free Sgt. Tahmooressi. Ask them to please contact Secretary of State John Kerry. Be concise, stick to facts. Do NOT make threats. Be professional and courteous. Keep it brief. This is an effort to elicit help from Congress and the State Department on behalf of Sgt. Tahmooressi, not a letter to air all of your grievances. You may wish to do that in a separate letter and, we encourage that if you so choose. 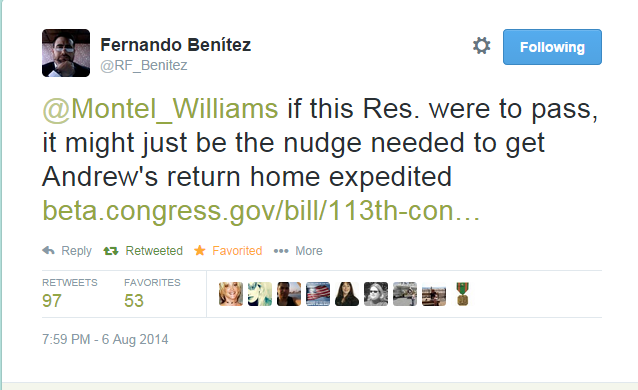 Our elected officials represent us and this is a proper and appropriate request. A sample could be “Sgt. Tahmooressi has been in a Mexican Prison for over two months for a wrong turn into Mexico”… etc. You may wish to include your contact information and request a return phone call or email etc. Let’s slam the phone lines, crash the servers and jam the Fax lines. This is a major “CONTACT CONGRESS” push. If you’ve no idea what to say, please message the Facebook page for Sgt. Tahmooressi here and someone will assist you. Finally, post this link on your Facebook page, tweet it, email it. Let’s get everyone involved in this. Send it to any person or entity that you may know that can be of assistance. Once done, please post on the Facebook page (above) what you have done as it encourages others to act as well. Let’s do this! On behalf of the Tahmooressi family and our entire effort to free Andrew, thank you. I came across this tragedy on my friend Suzi’s Facebook page and I have to do something. If you can help this family, please do. I’ve linked to a local news source’s piece on this as well. Monique, Jonathan David, and Titus were rescued from the vehicle, but Elise, 3 and Enoch, 6 weeks drowned. “Imagine, if you can, putting an addition on your house so your daughter and son-in-law and their kids could move in with you, and being so excited about it because you want nothing more than to have the whole family together. The kids arrive and you get to spend the day together…11 whole hours…, holding your new grand-baby for the first time, but you’re worried about the babies smelling the paint fumes in the new room because you just finished painting so you send them off to spend the night with friends. They don’t make it out of the driveway because the road is narrow as it crosses the dam holding in the pond and your daughter miscalculates in the dark and into the water the car goes. The grandfather…our friend…jumps in and is able to get his fingers on the buttons of the car seat restraints but the water is murky and 35 degrees and he can’t get the baby out. By the time the EMTs arrive you’ve been able to get the mother out but her lungs are filled with mud and she’s freezing and you have her covered in 20 blankets and you’ve put on your Navy diving gear, going in over and over again, but it’s been 35 minutes and you still can’t see to get to the children. How do you hold this? How do you ever look at your dream farm the same again? How do you cross that dam, day in and day out? How do you put pieces together whose glue had never had a chance to dry? 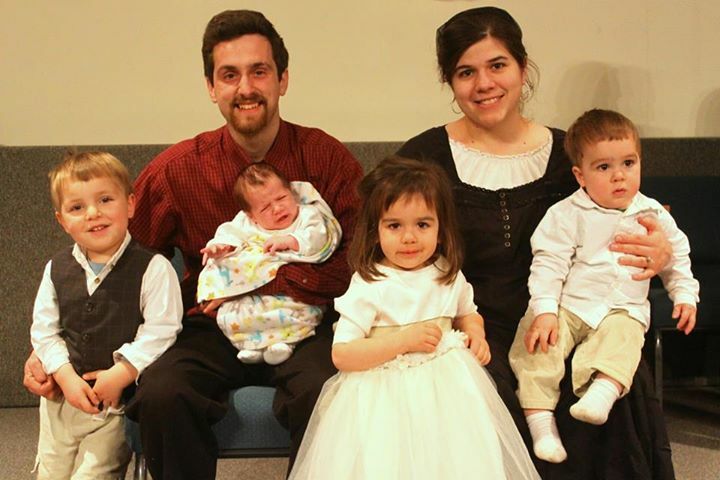 The entire community is coming together to provide help and support for the Einwechter family but additional financial help is needed. Can we help them not have an immediate financial burden? Thank you all. So, I can’t sleep. I can no longer blame the loud clock someone gave us for a wedding gift as I finally succumbed and put it in the garage to give to charity. It’s just too loud. Anyway, I give up and get up, quietly so as not to wake the sleeping man and dog. I get out the door and downstairs without kicking the door jam or any other clumsy thing you might expect to hear next. I Tiptoe to the coffee maker and I have to grind the coffee, dangit it’s noisy, still, not a creature stirs. I go to turn on the t.v. and nothing. The remote has died overnight. I look but am out of AA batteries. I power up with a sip of coffee and start searching. Nothing in the kitchen has an AA battery. Quietly I look, nada. I head out to my husband’s tool bench to start searching the man toys. It all looks frightening and am pretty sure something will drop and wake the boys upstairs. I’m about to give up when I hear the damn clock in the box waiting for Amvets. TICK.TOCK.TICK.TOCK.TICK.TOCK. Please let it be an AA battery. IT IS! I have to pry the battery out but I do, hurry in, put it in the ailing remote and pray it’s enough juice to give me the morning headlines. Apparently, in my earlier stupor I had been hitting the up volume on the actual T.V. set (who knew)? and the T.V . comes on LOUDLY. I drop the remote, it hits the coffee table and goes flying. I curse. I am chasing things down and the TV is blasting some infomercial from whatever channel was on last night. I finally get it all fixed and I hear scratching from above. It’s either the dog scratching at the door or, not sure. I stand perfectly still until it stops. Anyway, that’s my day thus far. Oh, the moral of the story? Take the batteries out of the loud clock that’s been torturing you for years before you give it to charity and let them scratch for a while. Eventually they might fall back asleep. Good morning everyone!